Siem Reap, famous today for the temples at Angkor Wat, was once famous for something entirely different: silk. Now the city’s old artisan reputation is making a comeback. Not far from the monumental ruins is the quiet and leafy Angkor Silk Farm, part of a fair-trade initiative to employ rural Cambodians and revive a dying art. As a World Heritage Site, Angkor is renowned for the magnificent vestiges of the ancient Khmer Empire, with its regal builders and craftsmen. In more recent times, years of war and genocide decimated a great number of the heirs of this artistic tradition. With them disappeared a vast body of skills and expertise. Set against the backdrop of the glorious Angkor temples, Artisans d’Angkor is a Cambodian company of arts and crafts devoted to the revival and preservation of Cambodia’s artistic traditions. Since its establishment in 1998, Artisans d’Angkor has created over 1,000 jobs and has pioneered a new social policy in Cambodia with guaranteed levels of pay along with social and medical benefits. In 2003, the organization became a limited liability company with a minor public share. It is now completely self-financing and independent. 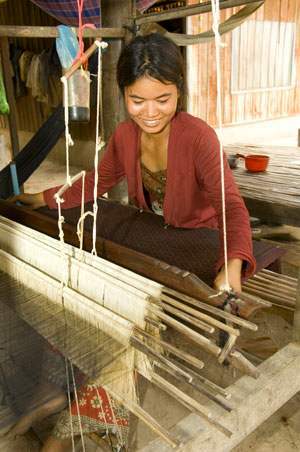 The 20-acre silk farm in Siem Reap Province provides handicraft training and employment for villagers ages 18 to 25.